I knew when I saw this pullover hanging in my Queen st. lululemon that it was definitely a piece I wanted to add to my collection, despite the fact that it was a half-zip pullover. The details are lovely and add a reflective flash of style. The Run: Reflective Pullover is a stylish top layering piece with gorgeous details such as the prominent reflective strips that have a ruffle like appearance around forearms and back, as well as the over sized collar and reflective zipper details. The pullover is made with lululemon moisture-wicking Power Luxtreme fabric which is brushed on the inside making the pullover warm and soft. As most of the outer lululemon run layers, the Run: Reflective Pullover contains built-in flip over “cuffins” to keep the hands warm, as well as their typical flat seems and mesh panels. 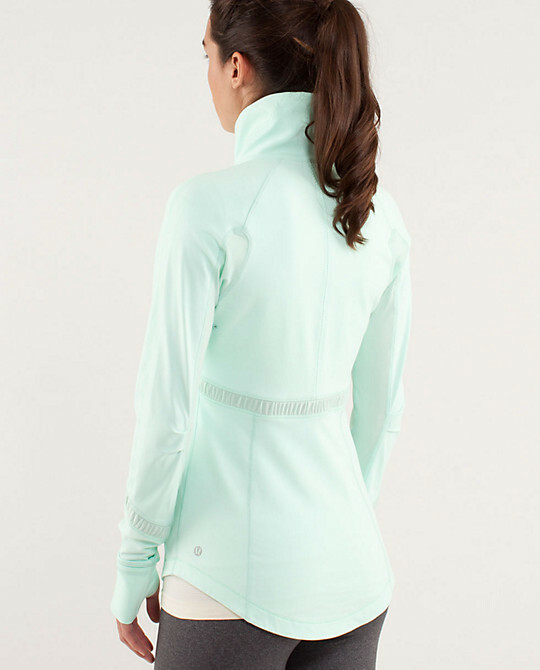 Love the colour “mint moment” so although I don’t typically run in half-zips, I knew I wanted the pullover because of its gorgeous colour, and big collar. The pullover fits very well being true to size and with its mesh panels provided lots of movement while on the run. The large “muff like” pocket across the front creates an interesting look and allows for ample storage, however something large and heavy (like my iPhone) flapped around, while smaller items (like my id and lip gloss) were a much better fit. One thing that I especially enjoyed was the high collar especially in the back of my neck (it comes up to just below my ears) and in the front contains additional support with a snap to hold the weight of collar in place. I’m typically not a fan of half-zip pullovers. Not just in my run gear, but in regular clothes as well as I don’t like getting my pony messy (yes, even before a run). So it’s not really a concern as much as a personal preference, but wanted to let you know. A great piece of spring! Wonderful light colours, with a ton of reflectivity make it perfect for a run during dawn or dusk. The features such as high collar and large pocket and useable features all while adding style. 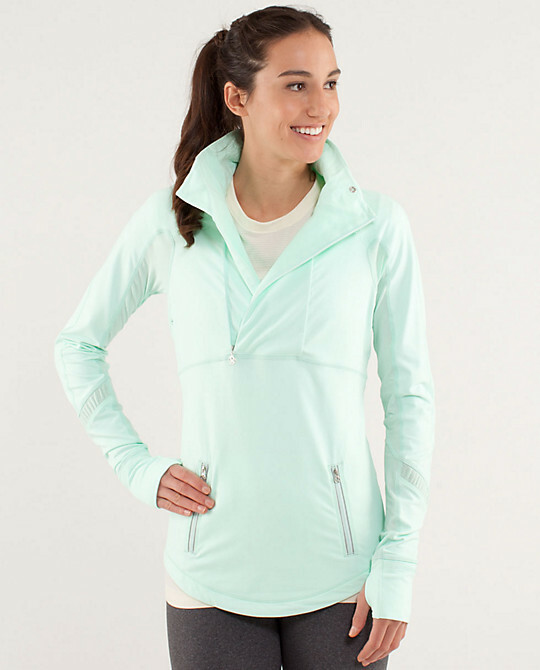 If half-zips are your style, definitely consider adding this piece to your run gear!